Unstoppable Harrogate RUFC Ladies took a step closer to the Women’s Championship North Two title when they beat Southport 43-0 on the road. Lucy Barnett’s side recorded a 10th consecutive win on Sunday afternoon, a result that sees them extend their lead at the summit to 21 points. 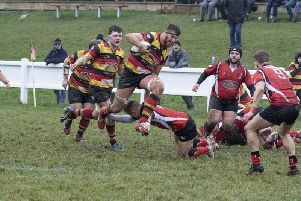 The hosts applied some early pressure, battering away at the Harrogate try-line after winning a penalty and kicking to the corner. The Rudding Lane ladies managed to hold out, however, and when they reclaimed possession captain Rose Jay made it as far as the halfway line on one of her trademark runs before finally being tackled and offloading. Sarah Foster then found fellow centre Kel Morgan, and with winger Sophie Wilson in support, Morgan sold her opposite number a dummy and powered through a gap in the line it before diving over the whitewash. Full-back Lauren Bolger added the extras for a 7-0 lead. 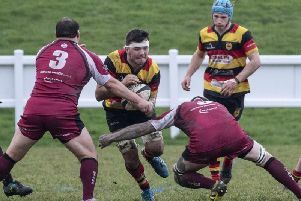 ‘Gate were soon back on the offensive as fly-half Alex Wallace made it past two defenders and carried on until she tripped over and brought herself down. The visiting backs then spread the play quickly through the hands and to the right flank where it was picked up by Rachel Demoraes who touched down following a dramatic dive over the line. A long break in play then followed due to an injury suffered by one the players, however when the match resumed, Barnett’s team picked up where they left off. They were eventually dispossessed and Southport went on to enjoy a spell with the ball in hand. Ill-discipline led to the home team being penalised at the breakdown and Wallace took a quick tap, broke through the defensive line and handed-off a would-be-tackler as she pushed herself over the whitewash. She added the extras herself and increased the score to 19-0 just before the half-time whistle. The second period began with Jay and Wallace making good progress into home territory. Front row replacement Lizzy Mason then took over, powering through for another try and Wallace booted over the conversion for a 26-0 advantage. With Harrogate now in full control of proceedings they began to turn the screw. Winger Izzy Harris picked up the ball then put her foot on the gas, running all the way through to Southport’s 22. She was stopped just short, however Foster was in support to receivean offload and cross wide on the left. Another fine Wallace conversion followed, this time from close to the touchline, stretching the away lead to 33 points. Harris was at it again minutes later, making another epic run up the left before she was caught and the ball was quickly switched to the other side of the pitch. Harris’ fellow winger Simone Christopher caught a high ball before slaloming her way through the defence and dotting down. With five minutes remaining the visitors were hungry for one last try and it arrived when Wilson got her name on the scoresheet. After a steal close to halfway, she took advantage of the space in front of her, running through several defenders before rounding things off at 43-0.